Design your own custom jewelry using Shrinky Dinks, polystyrene plastic sheets that shrink when heated to 325 degrees Fahrenheit! Join guest expert Tricia Powell to learn all about creating your very own jewelry. From keychains to earrings, you can create your jewelry for yourself or to share with friends. 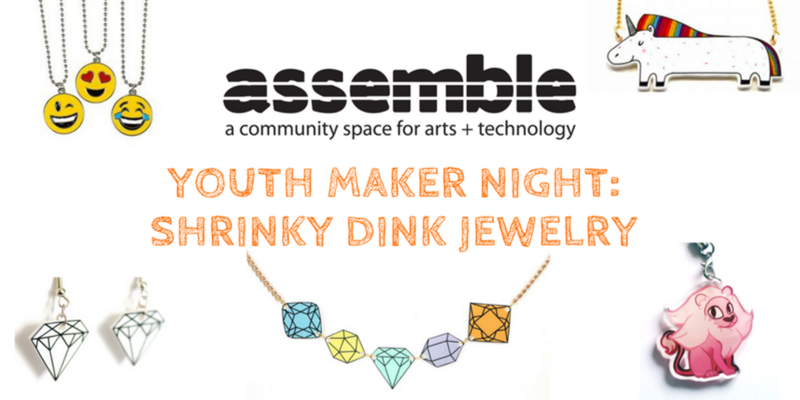 Youth Maker Night is a free, interactive monthly workshop for students in grades 6-8! Make new friends in a community setting while participating in hands-on STEAM (Science, Technology, Engineering, Art, & Math) projects led by Guest Experts. No experience necessary; just bring yourself and an excitement for learning!